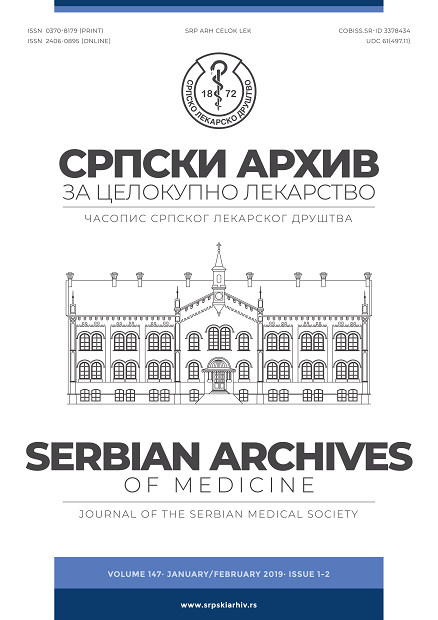 Serbian Archives of Medicine is an Open Access Journal. All articles can be downloaded free of charge and used in accordance with the Creative Commons Attribution-NonCommercial 4.0 International (CC BY-NC) licence. As of February 2017, the journal publishes accepted articles Online First. Beginning January 1st 2015, the journal Serbian Archives of Medicine accepts professional and scientific papers exclusively in ENGLISH. Also, before submitting a manuscript to the journal's Editorial Office for consideration, please fill out ELECTRONICALLY the NEW Submission Letter form, which is available for download in PDF from this link. We hope you will find the statement useful.